If you know me, you already know I am a big fan of eggplant/brinjal/aubergine. Fortunately for me, I have a number of delicious recipes that highlight this fabulously healthy vegetable. As a child I wasn’t too fond of the veg, but would eat it anyway, because preferences with vegetables were not really encouraged at home. I still remember that day when my folks enrolled me in a new school in another city. I had just come to the 6th grade. I was to stay on campus–in the boarding school. As it is, I was sad and a little upset about having to be away from home. So imagine my feelings when I found that my first meal there had a big share of brinjal on the plate. Sigh. Oh yes, I ate it anyway but that didn’t mean I had to love it. And I didn’t dislike it so much I needed to avoid it. Growing up, I discovered that the brinjal/aubergine/eggplant had more than one avatar, and I gradually just fell in love with the vegetable. Today, my son loves it as much as I do. My husband is not a huge fan, but that doesn’t mean he’ll skip it when it is cooked. He loves bhindi (Okra) and doesn’t mind if we make it every day! Ha, ha. So today, I am going to share one of my most favorite recipes–learned from my friend who hails from Telangana–and also, I enjoyed it for the first time in her house. Now of course, it has become a regular in ours. I guarantee you’ll love it too! By the way, the eggplant comes in a variety of colors, shapes, and sizes. It is well documented that the anthocyanins in this veg is good for heart health, and the chemical nasunin in it boosts blood flow to the brain. You can cook it by steaming, roasting, boiling, baking and frying. It is fiber-rich and low calorie, and full of nutrition. So let’s look at how to make sliced eggplant curry, Telangana style, shall we? In a large, wide bowl, mix all the ingredients for the marinade into a smooth consistency – should be like bajji batter. Slice the brinjal into 2 mm thick slices. You’ll get quite a few from one brinjal. Dip the brinjal slices fully in the batter and keep bowl covered for about 20-30 minutes. In a wide pan, heat 3 tbsp oil. When they sputter, add the urad dal. When the urad dal turns golden add curry leaves and jeera/cumin seeds. Now add the finely chopped onion and let it turn golden. Turn down the flame of the stove. 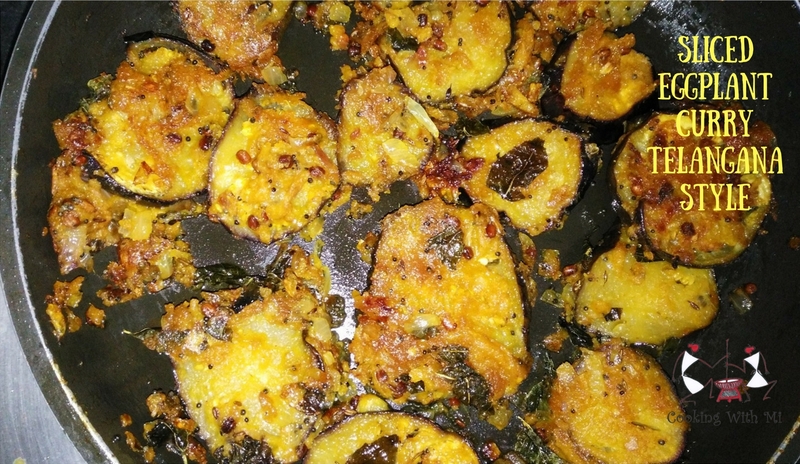 Place the slices of brinjal covered by the batter on the kadai. Gently flip the slices over after a few seconds, when the batter latches on to the slices. Let the brinjal cook on the low flame. Cover the kadai for a couple of minutes to cook–the bharta baingan cooks very quickly. Now uncover the kadai and turn up the flame. Flip the slices over every few seconds to get that nice crispy edge. When you’re satisfied that the brinjal is cooked, turn off the stove. If there are too many slices to cook in one go in your pan, cook in two batches. The onions are entirely optional. I like to add them because, yum factor. You don’t have to cook the brinjal slices and onions together. You can separately saute the onions, arrange on a plate and layer the brinjal slices on the onion. Or the other way around. Be creative! Not a fan of urad dal in the seasoning? No problem. Skip it. Apparently these can be baked in an oven after brushing the cookie tray with oil. Yet to try that. Do try the recipe and let me know how you liked it! I’m a big curry and rice or even better Biryani person myself. Need to have it almost every day or I’ll go into withdrawal. Decent take out Indian food is reasonably affordable here in Toronto, especially considering how long it takes to cook Indian with all the spices and masalas … so no real need to cook. But I gotta try out your recipe because of the pic. Thank you Mark! Yes, I’ve heard that Toronto has some amazing eateries and I visited a few myself during my trip there four years ago. Wonderful memories! I’d love to know how the recipe turned out for you! Have you enjoyed the traditional Hyderabadi Biryani? Thanks so much for this Vidya!! Can’t wait to try this out… It looks absolutely yum!! Yummm!! I am looking for brinjal dishes since my recent conversion to an avid follower after I had lip smacking baingan bharta at a friend’s place. This looks like a lovely dish! Going to try it soon. But tell me, will it have gravy to go with or be a dry sabzi? Hi Kala! No gravy in this. It is a dry subzi, unless you count the juiciness of the brinjal. You will love this! Thank you Renuca! So happy you like it! Now you’ve inspired me to post more often!